1 days to go!Are you ready to go back in time? It’s that time of the year when we dust off those maradona sneakers and get ready to do the Shabba Doo! The 360 Oldskool Reunion is back with double the fun, double the music and double the games. Come play good old busu, kwepena, dulu and experience more oldskool memories. 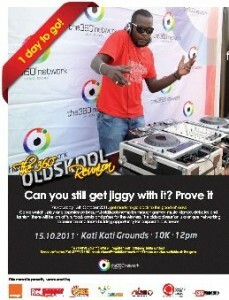 Entrance is only 10k, gates open at 12 pm on Saturday, 15th October at Kati Kati grounds. Come and catch up with your OBs and OGs and who knows, you could meet your Soci-mate, or that guy who used to tap your grab all the time. Don’t be late. Don’t RSVP. Just be there. The 360 Oldskool reunion is proudly sponsored by Orange, Red Pepper, SMS Media, Oxford Digital Media, NBS, CEO Magazine and Sanyu FM.